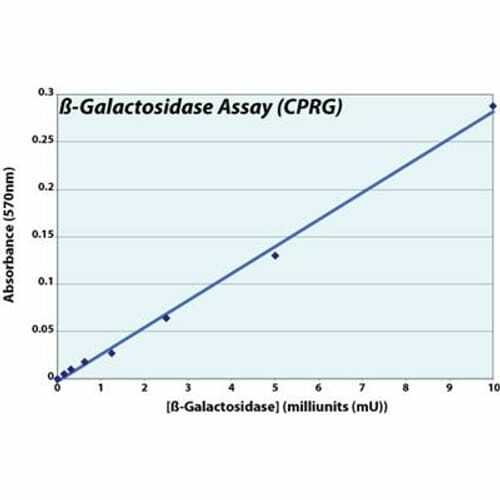 β-Galactosidase Assay (CPRG) provides an easy, rapid, and highly sensitive method for determining the β-galactosidase activity in the lysates of cells transfected with a β-galactosidase expression construct. The β-Galactosidase Assay (CPRG) assay uses chlorophenol red-β-D-galactopyranoside (CPRG), which is up to 10 times more sensitive than the classic o-nitrophenyl-β-D-galactopyranoside (ONPG) β-Galactosidase assays. This increased sensitivity makes it simpler to measure β-galactosidase activity in cells that are difficult to transfect or have low β-galactosidase activity expression. β-galactosidase catalyzes the hydrolysis of the galactoside analog chlorophenol red-β-D-galactopyranoside (CPRG). Cell lysates are incubated with the supplied reagents and the β-Galactosidase converts the yellow-orange CPRG substrate into the red chromophore chlorophenol red, yielding a dark red solution. The β-galactosidase gene functions well as a reporter gene because the protein product is extremely stable, resistant to proteolytic degradation in cellular lysates, and easily assayed. The levels of activity β-galactosidase expression can be quickly measured by this method. 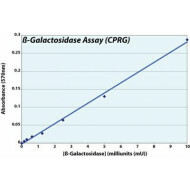 β-Galactosidase activity is measured using a spectrophotometer or a microplate reader to determine the amount of substrate converted at 570–595 nm. Although the CPRG β-Galactosidase Assay Kit provides all the required reagents for 500 micro-assays in a 96-well plate, it is easily adapted for different assay size. β-Galactosidase Assay (CPRG) provides an easy, rapid, and highly sensitive method for determining the β-galactosidase activity in the lysate..